OTTAWA -- Justin Trudeau's ongoing effort to breathe new life into Canada's free trade ties with the United States will force him to make the case to a group of skeptical Chicago students. The topic of free trade and the negotiation of a renewed North American free trade pact will be hard to avoid Wednesday when the prime minister takes the stage at the University of Chicago. Free trade is a delicate issue in the U.S. Midwest, where there is a feeling that the North American Free Trade Agreement has cost American industrial jobs -- a favourite talking point of President Donald Trump, one of NAFTA's most strenuous critics. Trudeau's message of progressive trade agreements that work for everyone will be tested in Chicago because not everyone in the audience will believe him, said David Axelrod, a former top adviser to Barack Obama. "There are a lot of young people for whom globalism is not an unalloyed good," said Axelrod, who will be onstage interviewing Trudeau during the afternoon event. "The discussion ought to be, 'How can you construct trade agreements that benefit not just industries, but also workers in our respective countries.' That's what these kids are concerned about. They're concerned about globalization as a force that drives inequality and I know that these are issues that (Trudeau) has thought about as well." The stop in Chicago will be Trudeau's first on a four-day swing through the United States, during which he is also expected to push trade during stops in San Francisco and Los Angeles, where he will give a speech to a sold-out audience at the Ronald Reagan Presidential Library and Institute. Talking about free trade at the centre founded by the president who signed the Canada-U.S. free trade in the 1980s will invoke a powerful image to Republican lawmakers, said Sean Speer, a Munk senior fellow for fiscal policy at the Macdonald-Laurier Institute. "He (Trudeau) is going to kind of be the more full-throated champion of Reagan's free trade vision than the current Republican president," he said. "It would be counter-intuitive and really powerful if he owned the Reagan legacy in his remarks." The next round of NAFTA negotiations faces multiple sticking points that negotiators hope to sort out before the twin disruptions of a presidential election in Mexico and U.S. congressional midterms. The three sides must still figure out rules around autos, a sunset clause and an mechanism to resolve disputes between countries and investors. There are also U.S. demands for greater market access to Canada's protected dairy industry, amplifying Trudeau's message among dairy farmers in Illinois, neighbouring Wisconsin, and California. Trudeau will likely press the case for regional trade regardless of what happens with NAFTA, given Trump's repeated threats to tear up the agreement, said Kathy Brock, a professor in the school of policy studies at Queen's University. The message to American audiences will simply be, "Canada is still open for trade even without NAFTA," Brock said. 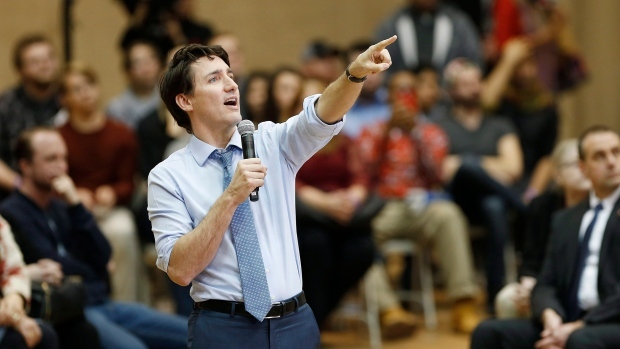 Students at the University of Chicago's Institute of Politics put Trudeau at the top of their wish list for speakers at the institute's fifth anniversary event. Axelrod said many of the students at the institute he founded identify with Trudeau and his brand of politics. "And perhaps in the era of Trump, there are a lot of students who are looking north and feel a sense of identification with the sense of direction he's leading your country." Axelrod will put questions from his students to Trudeau during the question-and-answer session, and will also interview him for his podcast, "The Axe Files."